The mission has no power! That is the call we received Wednesday night around 7:30 pm. From there it was all hands on deck figuring out a plan for the evening as we prepared to sleep almost 50 homeless men. 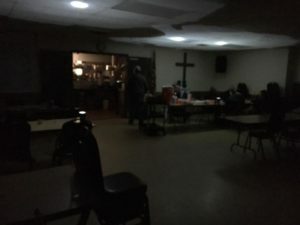 We worked closely with Canton Fire Department, AEP and The City of Canton to determine whether the shelter could remain open for the night or if the men would need to be transferred to another location. For the most part the resident men slept just like they would any other night. But not me! I worried. I worried the men would not have coffee in the morning. What about our freezers and coolers full of food? How would we serve a meal to our dinner guests? I contacted our new director of community relations, Kristie Woods, and we began planning for the morning. Through her contact, Starbucks donated 100 cups of fresh coffee for the men. I picked up fresh donuts for everyone. (Just a side note, we typically receive donations of day-old donuts so fresh donuts were a real treat, and yes, there was one missing from the box when I gave them to the men.) First problem solved! When I arrived at the mission at 6:00 a.m., the kitchen was warm from the heat of the pilot lights on the gas stove. I knew that was not helping our refrigerated food. I began making calls to seek advice from dear friends about how to save all the meat in our freezers. One wake-up call led to another. I have to be honest with you; I was not hearing the responses I wanted. God knew what we needed and was using me to help solve our problem so I did not give up. People started calling me back and soon after, Art showed up from Kidron Electric to help us get a generator, a very large generator, to run the entire mission! Tim O’Neill, director of operations, worked diligently with Art preparing for the generator to arrive. AEP was on hand to disconnect our power source from them so Art could connect us to the generator. I am sure that is more information than you wanted to know, but my point is working together made light work and that problem was solved! Doug Pugh, our local Chick-Fil-A hero, donated sandwiches for the men’s lunch. What a blessing! We were prepared to purchase the sandwiches but instead he told us to, “Eat more chicken!” No, what he really said was, “Let us know how else we can help.” Another problem solved! U-Londa was there to begin preparing our evening meal with her kitchen workers. The Canton Health Department arrived to guide her through safely handling and disposing of food in the coolers. One more problem was taken care of! The initial call for support from the community was totally overwhelming! I am writing this at 2:53 in the afternoon in tears because of how much people really care about the people we serve at Refuge of Hope and how they want to help! My dear friend, Dave, took my call at 6:30 a.m. to lead me to Kidron Electric. I am forever grateful for how he has always been there to help us! How many people would have taken a call at that hour? WHBC radio kept everyone up to speed with the latest information regarding the power outage calling several times for updates. Listeners called us to offer assistance. Our Facebook followers sent words of encouragement to help us. Prayer partners were praying. The list goes on and on! What could have been a crisis was only a blip on the radar. God was in control and once again taught me how to use the resources of people He has placed in my path. Our staff is a team that proves over and over how dedicated they are to this ministry. The resident men were real troopers and so understanding through all of this. I am so blessed to be a part of this wonderful community of caring people. I am privileged to work in this amazing ministry at Refuge of Hope. When I am overcome with a situation, I know God is there to guide me, give me wisdom, and wipe my tears when I tell Him that He overwhelmed me with His goodness! Be overwhelmed by the goodness of God this Easter! Personally, I am joyfully overwhelmed when I reflect on how God chooses to work in my life.